Kevin can’t stop skateboarding. For over 20 years, the challenge, creative outlet, and community formed around skating has become a part of him. After moving to Brooklyn in 2005, he began practicing yoga and found this to be the perfect balance to his skateboarding. Originally from Massachusetts, Danny is a skater/surfer/snowboarder, who joined SKATEYOGI in Fall 2018. A graduate of Tufts University (BA in Organizational Economics) Danny is a great addition to our team bringing in positive vibes and his experience as a swim instructor/life guard/captain of Tufts' squash team! Brad is a skater/writer/musician. A graduate of Baruch College, Brad brings in a vast knowledge and experience in teaching skateboarding to all ages. He has gotten a nick name "Rad Brad," from one of our SKATEYOGI students! Chris is a skater/writer/musician, who has been skateboarding since he was 12 years old. At age 13, Chris helped organize a town “Skate Day” to gain attention from his hometown's government and bring a skatepark to his community. Chris is very proud that the skatepark in Riverton, Wyoming still stands today. 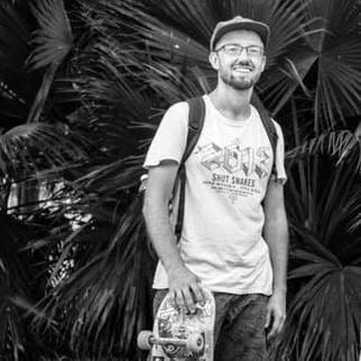 A graduate of Webster University, St. Louis (BA in Journalism), Chris is really excited to be part of SKATEYOGI and share his skate tricks with everyone! Ramiro is a skater/artist who has done art for our camp shirt in 2016. He has taught skateboarding to a various range of students and led a skate camp in Massachusetts. Ramiro has shown his work internationally and loves showing our students how to draw all sorts of interesting things!